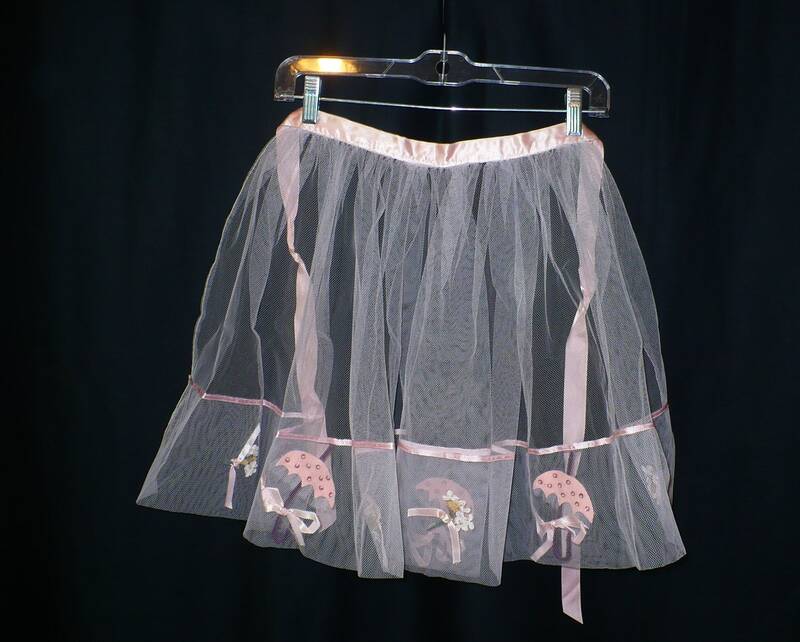 April showers bring May flowers.... charming sheer apron made of fine gauge net tulle. 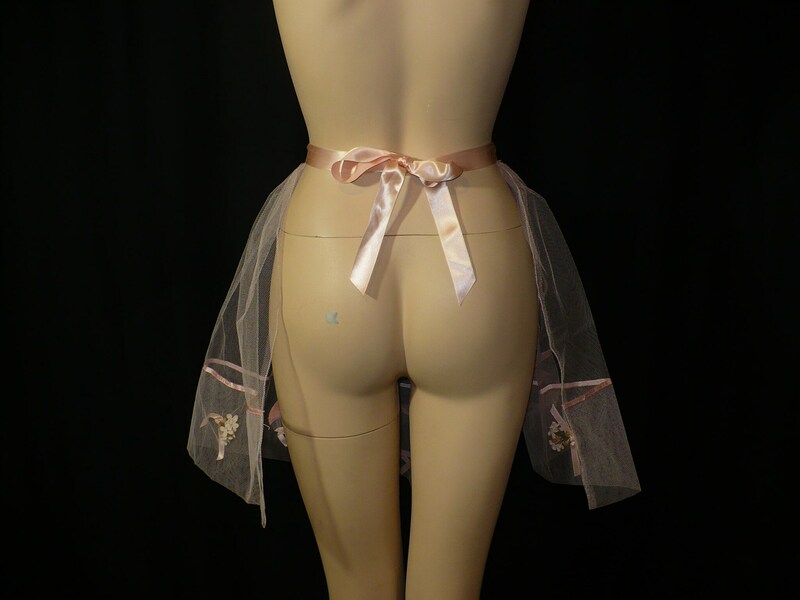 Pink satin waistband and ties; pink satin ribbon trim. 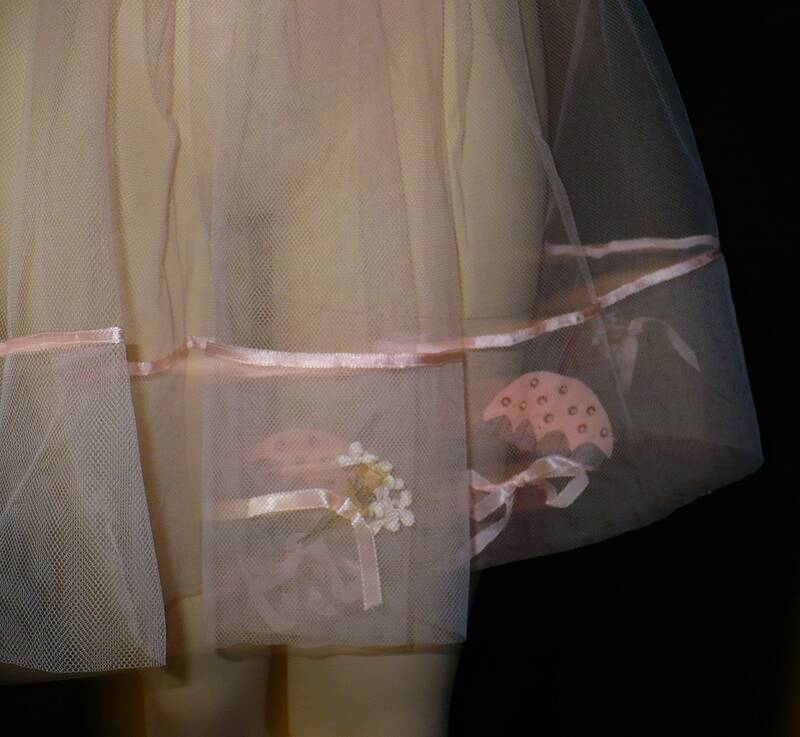 Darling millinery flower nosegay bouquets with pink satin ribbon accents. Pink felt umbrellas with sequins and bead "raindrops" on the umbrella's canopy. FAST SHIPPING: We strive to ship within 24 hours. USA DOMESTIC SHIPPING: Safe and speedy shipping through the United States Postal Service. We provide free online tracking and delivery confirmation services at the time of posting whenever possible, depending on destination country. GLOBAL SERVICE: We ship worldwide. VAT, IMPORT DUTIES, & TAXES: Please know all international customs forms are filled out honestly and accurately. Import duties, VAT taxes and any other charges may not be included in the item price or shipping charges. They must be paid by the recipient in their own country - it is not possible, or legal, for us to pay these fees. LOVE THE PLANET: Get Lucky Vintage is committed to sound environmental practices. Everything is shipped with attention to the protection of your items, while still using only the minimum amount of packaging needed. 2. USPS now charges Senders for returned/unclaimed International shipments. The amount of this service varies for each shipment and each country. This return shipping cost will also be deducted from any refund due upon receipt of Unclaimed Packages. 3. A 25% re-stocking fee will be withheld on Unclaimed Packages. This will be applied, but is not limited to, the losses associated with the absence of said item(s) from inventory for valid purchase, fair labor costs associated with retrieving unclaimed item from post office, any and all additional processing of said Unclaimed Package. WE CARE: We want you to be happy with your purchase. We take great care to provide a variety of photographs detailing each item. We measure accurately and disclose the condition of each authentic vintage offering. Please review all the measurements, description, and photographs prior to ordering to ensure a good fit and your overall satisfaction. If you want additional images or information, please ask prior to purchase. Want to return something? We're sorry your order didn't work out, so let us make things right. First, read through our Returns Policy, then follow the directions. It's really easy. We must be notified of your desire to return your purchase within 3 days from the date of delivery. With approval, item must be postmarked for return shipment within 7 days from the date of delivery. If 7 days have gone by since your purchase, unfortunately we can’t offer you a refund. To be eligible for a return, your item must be unused and in the same condition that you received it. It must also be returned in the original condition and packaging. Several types of goods are exempt from being returned. Examples of non-returnable items include perishable goods such as food, flowers, books, newspapers or magazines. We also do not accept products that are intimate (hosiery, swimwear, underwear, for example), personal care items, or sanitary goods, hazardous materials, or flammable liquids or gases. Downloadable software products, holiday and seasonal items, and gift cards are not eligible for return. Consigned offerings are not available for return due to the unique nature of those transactions. No refunds are given on items returned with evidence of use (including but not limited to bad odors such as body, smoking, perfume, cologne, stains, pet evidence for example), items that are damaged or missing parts for reasons not due to our error. Any item that is postmarked returned more than 7 days after delivery to Purchaser. Only regular priced items may be refunded; sale items cannot be refunded. Please see "Unclaimed Packages" under "Shipping Policies" for more information regarding Unclaimed International Shipments. 1. Contact us prior to shipping to receive your mandatory Return Authorization Number (RAN) and confirmation of the return shipping address. All etsy return conversations must go through etsy conversation system. This will ensure transaction security, should either party request an etsy review. 2. You will be responsible for paying for your shipping costs for returning your item. Shipping costs are non-refundable. If you receive a refund, the cost of shipping the order to you will be will be deducted from your refund, as will a 25% re-stocking/processing fee. Once your return is received and inspected, we will send you an email to notify you that we have received your returned item. We will also notify you of the approval or rejection of your refund. If you are approved, then your refund minus shipping and the 25% re-stocking fee will be processed through etsy's Direct Checkout System, which is also linked to the website checkout system. If you haven’t received a refund yet, first check your paypal or payment account again. It may take some time before your refund is officially posted. Your privacy is important to us. When you purchase something from our store, as part of the buying and selling process, we receive the information you give us such as your name, address and email address. Email marketing (if applicable): *With your permission, we may send you emails or newsletters about our store, exclusive sales, new products and other updates. How do you get my consent? We use Etsy's Direct Checkout payment processing services, which means we do not ever see your credit card or bank card numbers. When you provide us with personal information to complete a transaction, place an order, arrange for a delivery or return a purchase, we imply that you consent to our collecting it and using it for that specific reason only. If we ask for your personal information for a secondary reason, like marketing, we will either ask you directly for your expressed consent, or provide you with an opportunity to say no. Our store is currently hosted on etsy, etsyPattern, and ebay. These online e-commerce platforms allow us to sell our products and services to you. Your data is stored through etsy's/eBay's data storage, databases and the general applications. As applicable, they store your data on a secure server behind a firewall. Etsy Direct Checkout: Get Lucky Vintage does not see your private payment account numbers/information at any time. When you click on links on our store, they may direct you away from our site. We are not responsible for the privacy practices of other sites and encourage you to read their privacy statements. (This includes Facebook, Pinterest, Instagram, and other social media sites, for example). ETSY COOKIES: Please visit etsy .com for their cookies policy. EBAY COOKIES: Please visit ebay .com for their cookies policy. This website/etsy store is operated by Get Lucky Vintage. Throughout the site, the terms “we”, “us” and “our” refer to Get Lucky Vintage. Get Lucky Vintage offers this website, including all information, tools and services available from this site to you, the user, conditioned upon your acceptance of all terms, conditions, policies and notices stated here. You are viewing these policies from our store that is hosted on etsy.com. They provide us with the online e-commerce platforms that allows us to sell our products and services to you. We reserve the right to refuse service to anyone for any reason at any time. You understand that your content may be transferred unencrypted and involve (a) transmissions over various networks; and (b) changes to conform and adapt to technical requirements of connecting networks or devices. You agree not to reproduce, duplicate, copy, sell, resell or exploit any portion of the Service, use of the Service, or access to the Service or any contact on the website through which the service is provided, without express written permission by us. In no case shall Get Lucky Vintage, our directors, officers, employees, affiliates, agents, contractors, interns, suppliers, service providers or licensors be liable for any injury, loss, claim, or any direct, indirect, incidental, punitive, special, or consequential damages of any kind, including, without limitation lost profits, lost revenue, lost savings, loss of data, replacement costs, or any similar damages, whether based in contract, tort (including negligence), strict liability or otherwise, arising from your use of any of the service or any products procured using the service, or for any other claim related in any way to your use of the service or any product, including, but not limited to, any errors or omissions in any content, or any loss or damage of any kind incurred as a result of the use of the service or any content (or product) posted, transmitted, or otherwise made available via the service, even if advised of their possibility. Because some states or jurisdictions do not allow the exclusion or the limitation of liability for consequential or incidental damages, in such states or jurisdictions, our liability shall be limited to the maximum extent permitted by law. You agree to indemnify, defend and hold harmless Get Lucky Vintage and our parent, subsidiaries, affiliates, partners, officers, directors, agents, contractors, licensors, service providers, subcontractors, suppliers, interns and employees, harmless from any claim or demand, including reasonable attorneys’ fees, made by any third-party due to or arising out of your breach of these Terms of Service or the documents they incorporate by reference, or your violation of any law or the rights of a third-party. These Terms of Service and any separate agreements whereby we provide you Services shall be governed by and construed in accordance with the laws of the State of Missouri, United States of America, without regard to its conflict of law principles. You agree that the sole jurisdiction and venue for any litigation arising from your use of or orders made on the Get Lucky Vintage sites shall be an appropriate federal or state court located in the County of Saint Louis, State of Missouri, United States of America. All text, site design, logos, photos, graphics, icons, and images, are the sole property of Get Lucky Vintage, ALL RIGHTS RESERVED. No materials from this site may be copied, reproduced, modified, republished, uploaded, posted, transmitted, or distributed in any form or by any means without Get Lucky Vintage's prior written permission. All rights not expressly granted herein are reserved. Any unauthorized use of the materials appearing on this site may violate copyright, trademark and other applicable laws and could result in criminal or civil penalties. In the event a product is listed at an incorrect price or with incorrect information due to typographical error or error in pricing or product information received from our suppliers, Get Lucky Vintage shall have the right to refuse or cancel any orders placed for product listed at the incorrect price. If your credit card has already been charged or payment has already been processed for the purchase and your order is canceled, Get Lucky Vintage shall immediately process the issue of a credit through the applicable Payment Processor to your account in the amount of the charge. Get Lucky Vintage reserves the right at any time after receipt of an order to accept or decline said order for any reason. Our current policy of fraud protection via shipping to confirmed Paypal addresses only does not imply a retraction to our Right of Refusal. We may require additional verifications or information before accepting and/ or fulfilling any order. Get Lucky Vintage shall apply and withhold the applicable sales tax for orders to be delivered to addresses within the State of Missouri, United States of America. Each customer shall be solely responsible for all sales taxes, VAT taxes, import taxes, use taxes and/ or any other taxes, including but limited to orders shipped to any other state, province or country. Questions about the Terms of Service should be sent to us at GetLuckyVintage @ gmail.com or through etsy's or eEBay's Conversation system, as applicable. Thank you for reviewing our Policies to insure your satisfaction and a smooth transaction. Please contact us if you have any questions or concerns.